Those prescient words were uttered not by Barack Obama, Bill Clinton or either George Bush, but by President Dwight Eisenhower in 1961. “His warning to the world, now even more relevant than ever, gave us the unsettling story we were looking for,” says Matchbox Pictures’ Penny Chapman, the executive producer of Secret City: Under the Eagle. The eagle refers to the Australian-American Memorial erected outside the Defence Department headquarters in Canberra which was unveiled by the Queen in 1954. 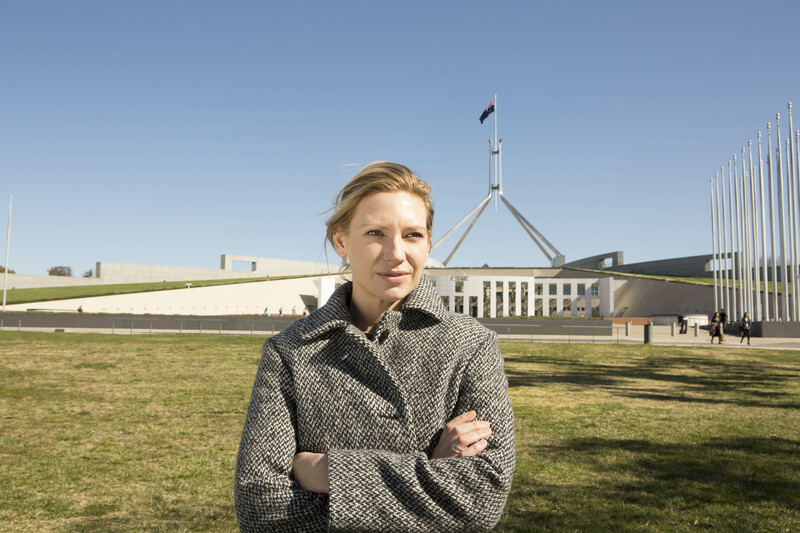 Produced by Stephen Corvini, the six-part political thriller picks up just after Anna Torv’s Harriet Dunkley is released from prison after serving a two-year sentence for writing a story which broke the government’s draconian Safer Australia rules. Now a media adviser to independent politician Karen Koutoufides (Danielle Cormack), Harriet becomes ensnared in a military and political cover-up involving Labor powerbroker Senator Catriona Bailey (Jacki Weaver). She uncovers a military program that is so secret that not even the Prime Minister knows about it, raising the question: Who is really running the country? Sacha Horler returns as Sky channel journalist Ludie Sypek together with Marcus Graham as Bailey’s chief of staff Andrew Griffiths and Justin Smith as Australian Signals Directorate director William Vaughn. The cast also includes Rob Collins as Major Joseph Sullivan and Robert Rabiah as a shady Canberra businessman. Tony Krawitz (Harrow, The Kettering Incident) is directing the first three episodes and Daniel Nettheim (Harrow, Doctor Who, Broadchurch) the back three. This is Rabiah’s second collaboration with Corvini following Safe Harbour, which premieres on SBS in March. Rabiah tells IF he has been keen to work with Krawitz and Nettheim ever since watching their debut films Jewboy and The Hunter. Matt Cameron is the showrunner. Cameron and Belinda Chayko, who both worked on the first Secret City, each wrote two episodes. Elise McCredie (Sunshine, Nowhere Boys) wrote one and Cameron co-wrote the other with playwright Angela Betzien. Matchbox received funding from Screen Australia’s Brilliant Careers program for Betzien, who was recommended to Chapman by Adelaide Festival executive director Rob Brookman, the former CEO of the State Theatre Company of South Australia. “Angela is a very impressive writer,” Chapman says. Supported by Create NSW and Screen ACT, the series will premiere on Foxtel’s showcase late this year.